Ready for more Thor: Ragnarok? That’s good because you’re about to see the God of Thunder slam through your screen with our Thor: Ragnarok trading card set, now available on e-Pack! 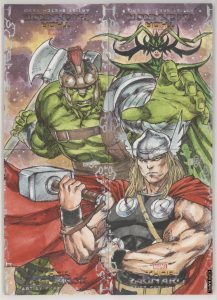 In your packs of Thor: Ragnarok, you’ll be able to find tons of sketch cards from your same favorite artists that you found in stores. 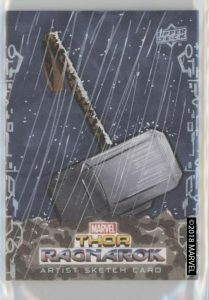 Including this amazing sketch card featuring Mjolnir in the rain, stuck in the dirt – reminiscent of scenes from the first Thor film. You can find memorabilia with the Armory set that contains swaths from outfits worn by many of the actors including Chris Hemsworth as Thor, Mark Ruffalo as Bruce Banner, Tessa Thompson as Valkyrie, Jeff Goldblum as Grandmaster, Cate Blanchett as Hela, and many more! There are even rare Armory pieces that include autographs from those actors! 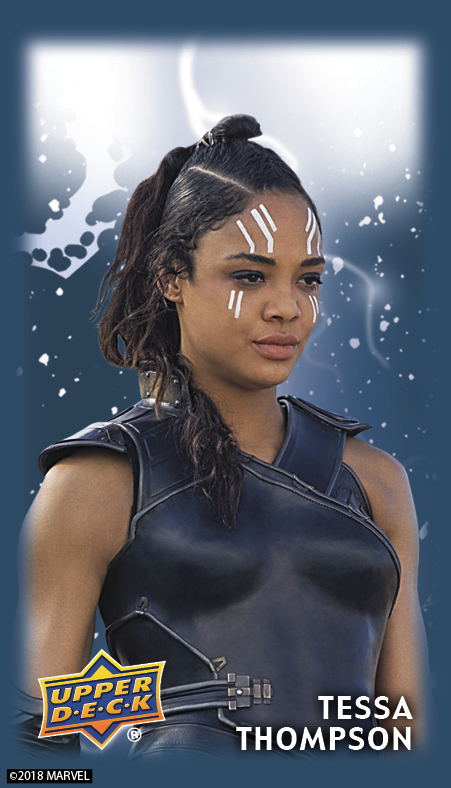 But the most innovative piece from our Thor: Ragnarok trading card set is the Dyson cards. 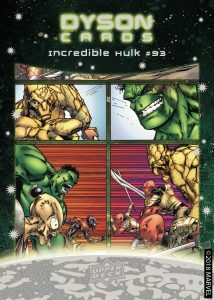 These cards feature artwork from old comic issues. Some are numbered to 15 and some to 5. The interest picks up, though, because Dyson cards can be ripped open with a tab on the back of the card to reveal a Tobacco card within – adding an extra layer of mystery. 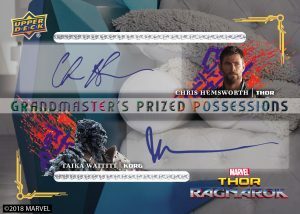 Some of these Tobacco cards contain actor autographs, including from Chris Hemsworth. If you’re here for e-Pack, though, you’re here for the Achievements! We have a ton of fun Achievements lined up. 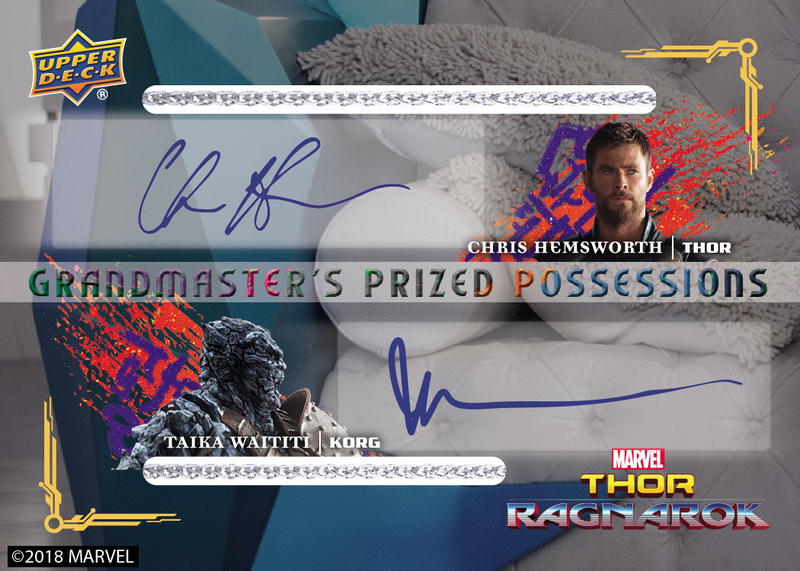 The first 10 users who redeem the complete set of Dyson Cards will unlock all 5 Acetate Mini Comics Actor Auto Master Achievement cards including a signed Chris Hemsworth and a signed Tessa Thompson card. The next 10 users who redeem will get Tessa Thompson and the other 3 cards, and the 21st through 100th redeemer will get the unsigned cards! 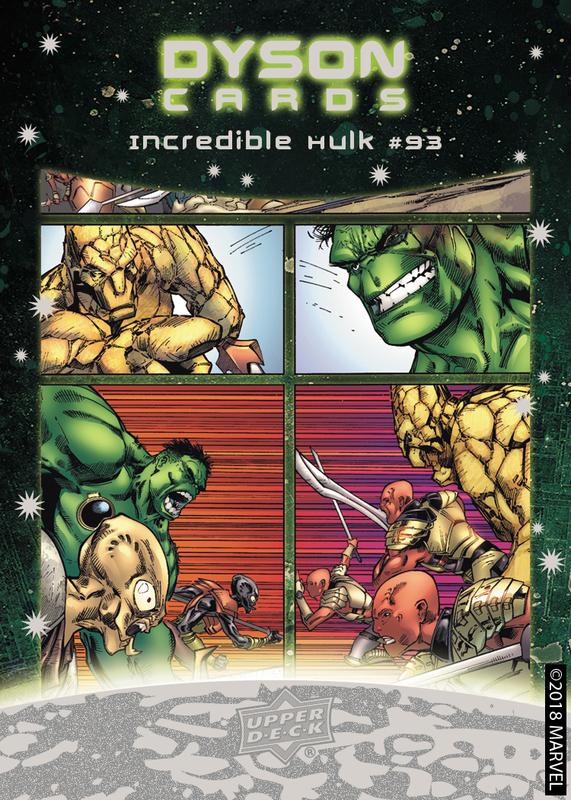 Stay tuned for more information about upcoming Achievements to this and all our other Marvel e-Pack trading cards! You can grab packs of Thor: Ragnarok trading cards on e-Pack now!